Today, I’m at the first full day of the American Geophysical Union (AGU) Fall Meeting, being held in Washington DC. It is estimated that there are ~26,000 Earth and space scientists in attendance to give presentations, attend workshops, and network within the community. 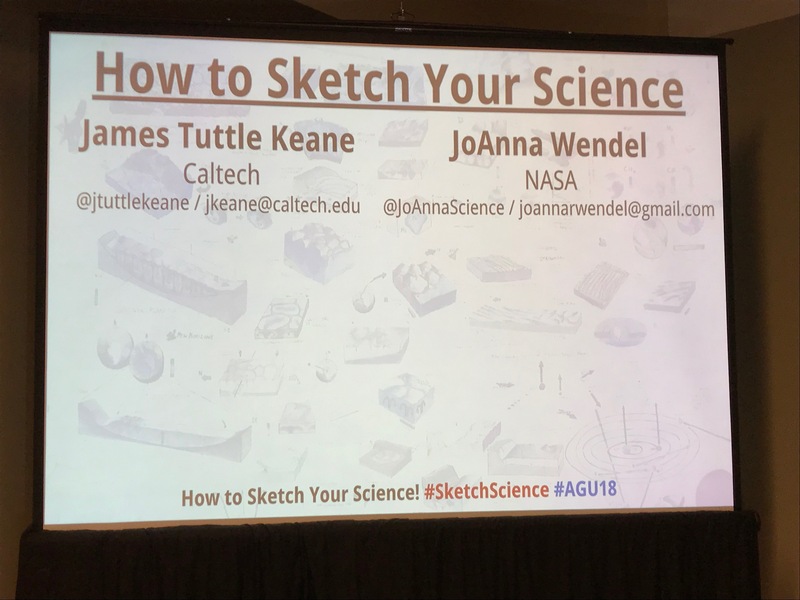 There are several different activities I’ll be a part of all week, but today, I started off by attending a workshop titled, “How to Sketch Your Science.” This workshop is part of AGU’s Sharing Science program and was led by James Tuttle Keane (Cal Tech) and JoAnna Wendel (NASA). I am in no way an artist beyond being able to draw stick figures and able to hold my own in a game of Pictionary, but I was curious to see how I might be able to use some of their tips for my own science communication. Others were curious to learn as well, since there were over 100 people that showed up for the workshop! This first experience made me not want to draw again (ugh!). But we then were given several tips to help us with our sketches: draw other items around the main items to put it in context (for example, if you have to draw an asteroid, draw stars or spaceships around it); know the audience, as that will dictate the level of detail in the sketch; know what you want to communicate; and, don’t be afraid to use humor. We were also reminded that this takes lots of practice, and successful comics such as XKCD are just stick figures with words to make you laugh. Anyway, I am curious to try to do more sketching. It certainly won’t become my day job(! ), but if I can get into a regular routine of doodling and sketching, I might be came to come up with some clever graphics that can enhance my own stories of science. Students – how would you feel if science sketching was now a part of our classes?